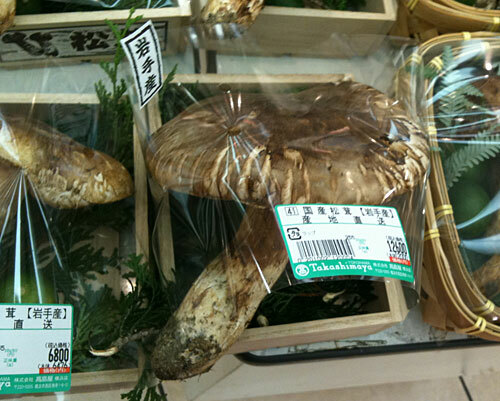 The prices differ, depending on where the matsutake come from, and their condition. Here's one from Iwate prefecture in the northern part of Japan. It's pretty big, but the cap has opened up. It sells for 12,600 yen, which is bout US $155 or 110 Euros at current exchange rates. For a single, albeit large, mushroom. Next to it you can see one priced at 6800 yen (US$84, €60), which was the cheapest one they had. It looked a bit sad, though I'm sure it's still fragrantly good and all. Moving further up the scale, here is a package of smaller matsutake with closed caps. They come from Nagano prefecture, and cost 31,500 yen ($389/€277). The best matsutake are held to come from the great city of Kyoto and environs. So at the top of the scale, behold this packet of small, closed-cap matsutake from Kyoto. Price: 52,500 yen - $648 or €462. I am guessing that the packet has around 100 grams of mushroom, so that comes out to $6,480 per kilo (€4,620) or $2900 or so per pound. Is it worth it? Well I guess to some people it is, since it is for sale. I haven't been able to bring myself to splurge on one yet though, even the cheapest Iwate prefecture ones. I mean, I could buy, say, an iPad here for less than the price of a packet of the Kyoto matsutake. There are cheaper imported matsutake, but they're held to be far inferior to the wild domestic ones. If you are lucky or rich enough to get hold of a matsutake, I'd recommend the dashi stock method first. Now a question for you - would you pay these kinds of prices for any food? Have you? What's the most you have paid for something edible? Submitted by maki on 2010-10-21 17:50. I would be curious of trying Matsutake. My boyfriend once bought me as a present for my birthday a huge black truffle, which I don't know how much he paid (I hope less than the most expensive Matsutake... ), but it was money well spent. We ate it for months and every single dinner was a feast. Besides I tend to have very vivid memories of food, so yes, I am ready to spend for getting nice memories, the way people will plash out for going to Disneyland and the likes.. It seems that there's a bumper crop of wild matsutake in California this year (like $25 a pound). If that's the case, maybe I'll try it. I'm pretty skeptical that there's any radical difference in taste (I really suspect that much of it is just mystique). Some difference, sure, but thousands of dollars worth? Hmmm. People's perceptions about rarity and cost really influence their beliefs about taste (see the studies on wine and price tags, or even the one where blindfolded tasters had issues distinguishing between red and white!). Well, I'd love to see a blind taste test by Japanese chefs and gourmets to find out. Hi, there! On 24 October, 2009 I hunted for Matsutake in the forests of Idaho. I consumed some. 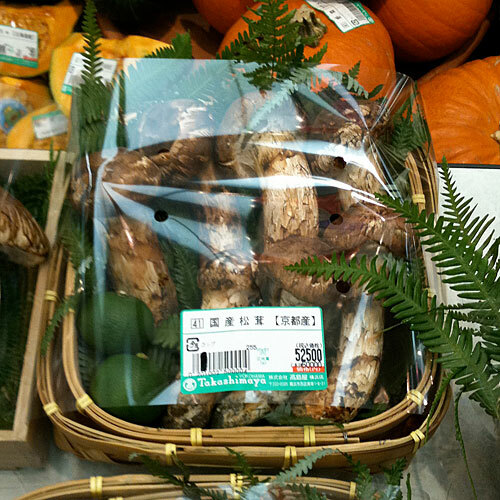 On 24 October, I bought matsutake at Teramachi Market in Kyoto. On the way home (I live in Ichihara), I found American matsutake for sale. The smell of the two mushrooms is wildly different. (My opinion is that the American version smells more strongly than the Japanese version. Oddly, the Japanese claim their mushrooms smell "strongest". It's pointless -- they smell different.) Is there a difference between them? Yes. Is it worth the price? Well... gustibus non disputandum est? Money isn't real? The Japanese mushroom is enjoyable, but like anything, you're paying for crowd control. Luckily, I got a SECOND serving today at lunch by my work buddies who know my proclivities. They're good. Life altering? Maybe no... but such a potentially powerful memory that it's worth the price. Better than the American version? Well, that's like comparing tangerines to oranges. It's only worth it for gaining experience or reliving a memory. As for the wine story, I will wager you that I can tell reds from whites, french from californian, coke from pepsi and all national brands of donut from the smell of their fat. Are the mushrooms on a regular shelf in the grocery store? Or are they kept in a special area so people don't poke and prod them? I'm quite cheap, so that (even the cheapest one) is way too expensive for me. Even though I here and there buy food by internet and I like to eat healthy, I don't spent a lot for food. Hi, Maki. This is really interesting. I'm just wondering if there's a specific reason these seem to be packaged with limes beyond aesthetics. If I had a lot of money I would probably spend a bit on unusual luxury foods but I'm in no position to consider it at the moment. Maybe some day. My mother did get real-deal caviar for us to try before her wedding and I've tasted various sorts of truffles but that's about it. I think I'd like to try really excellent champagne if money were no object, although that's not a food. Wow! 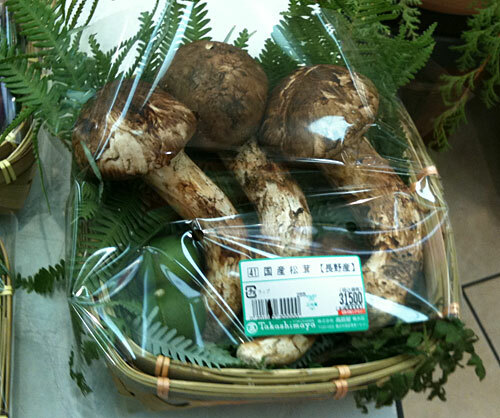 When I lived there about 15 years ago, a packet the size of the one with three matsutake in your photo was going for about 10,000 yen and at the time I thought that was expensive. I can't believe how much people will keep paying! Sugoi! This isn't a response to your question, but it is relevant. When I was a child in Japan, my father's Army division held annual Matsutake Hunts for the soldiers, civilian workers and their families. I remember driving out to pine-covered hills (hence the "matsu", yes? ), being divided up into two teams, and spending a sun-dappled Autumn day sniffing matsutakes out from under the red carpet of pine needles. Reading your post, and seeing the eye-poppingly, jaw-droppingly outrageous prices makes me wish I had been a bit more prescient and entreprenurial as a nine-year-old. If I could have only known and freeze-dried those puppies for later use; I'd be sitting pretty! The character for "matsu" means "pine", but also means "highest quality", so I wonder about the connection between the pine trees and the mushroom. My first guess would be that "matsutake" simply means, roughly, "top quality mushroom." In either case, it's a lot of money for a mushroom, yet I like the fact that quality can be prized so much over quantity that people will actually pay those kinds of prices on occasion. This comment is obscenely late, but matsutake are most definitely associated with Pine trees. They are a complimentary fungi that have a symbiotic relationship with the pine tree. I think the kanji is just a clever double meaning. I think wikipedia has a pretty good article about them if you want to put in a little more effort. I just finished a braise of matsutake and nappa that was wonderful. For those that haven't tried matsutake, don't disparage it because it's expensive. It really does have a unique flavor and is wonderfully fragrant. Whether it's worth hundreds of dollars/yen, I'll never know. Living in wet Washington state, there is an abundance of amazing mushrooms. This year the price range for freshly foraged natsutake is between $10-20 a pound. In the grocery store it's up to $80 for the perfect little matsutake buds. I'd say the most expensive foodstuff I've ever purchased was caviar (sturgeon roe) for $40 per ounce. This was a present for my mom. Luckily, I live in an area that has my favorite seasonal foodstuff relatively abundant and relatively cheap. My two favorite fall foods, matsutake and salmon roe. It hadn't occurred to me before but living in New Zealand does not offer the temptation of wildly expensive foods such as matsutake, truffles or caviar. Seafood is probably the most expensive local food, especially Bluff oysters and crayfish. I succumb to both of those occasionally and also to the extravagant single malt scotch that Karen mentioned. However food is one of the major influences in choosing where to travel abroad so I guess food is high on my list of self-indulgence! We used to get matsutake sent to us by Japanese friends who lived in the Pacific Northwest of the US where they grow. This was before they were discovered by the gourmet crowd. I just love these mushrooms and they evoke wonderful childhood memories. They defined the start of Fall. We used to get them for free, but I would pay these prices if I had to. The best prices are at the upscale mainstream markets here in California at maybe $20-30/lb., but the quality is not so good (often flat flavor). Local Japanese markets are a bit better, but cost maybe $80-90/lb. The best were still the gratis ones from friends (maybe it was just knowing that they came from friends?). I also liked to eat it in matsutake gohan, but I was just in Korea where it was prepared in Bulgogi. Thanks for posting this. Now I have to go out and buy some, as I have not done so yet this year. Natsukashi~! Just looking at these pictures make my legs hurt. The town I used to live in Akita had an annual "Matsutake Marathon". Apparently the region used to have a lot of them, but now the winners' mushrooms are imported from Korea :P At the end of the race, everyone chowed down on some matsutake gohan, which tasted great, but I get the feeling I would have scarfed down anything at that point! As for the name, I'm leaning more towards the pine part because of the kanji. And couln't "take" transleted to luxurious? In terms of health, this item is a YES. A friend of mine, she and her husband are in the matsutake business. We're located in the States, and every year they harvest a huge quantity from the wild mountains--then ship to Japan. But anyway. They're in their 40s and still have not had a child. So three years ago they finally decided to go for it. Obviously that meant >huge< risk for down syndrome. But she ate matsutake for around 4 months during her pregnancy. The baby was not only perfectly healthy, but when she was born, she had a whole head of thick hair right from the womb. I'm not talking about a thin layer of fluff; it was comb-able. There is something nutritionally insane about these mushrooms. Not to discount your friends' experience, but I have never heard that matsutake have any particular health properties beyond what mushrooms in general have. They could just have been blessed/lucky/etc. too. Which is not a bad thing! Sample size of 1, and you proclaim it a miracle food. Living in Hong Kong we are lucky enough to get the best from around the world, flown to our door (HK doesn't have much arable land and the quality from China can be questionable). 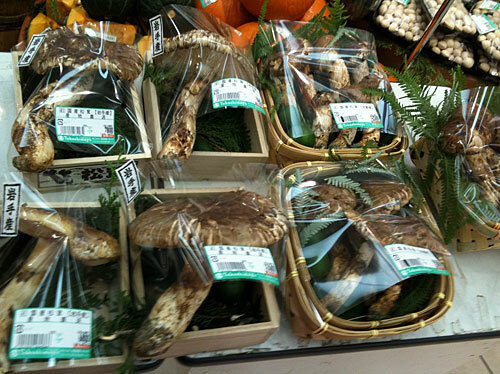 We get a huge amount of Japanese fresh food, including Matsutake. My splurge is Japanese apples, especially the large Mutsu and Sekai Ichi, we pay HKD62 (USD$8 Eur5.70) for each apple! Expensive but the taste is amazing. We are lucky enough to get 4 or 5 varieties of Japanese apples depending upon the season, including the ones that have the so called "honey" on the inside. Very different and sweet. I bought Matsutakes here in Vancouver (Washington, NOT B.C.) for $6 per pound. And that was for the good quality, young ones. The mushroom guy at the farmer's market was selling lower grades for $3 per pound. He had lots of them left toward the end of the day. There is (was?) a lot of matsutakes out in the woods this year. We've had a bumper crop of them this year in the forests on the west coast of British Columbia. I bought a huge one the other day at Fujiya Market in Vancouver for six dollars. We made matsutake gohan and used them ina duck gyoza nabe. The flavour they imparted to the broth was out of this world! Oh my goodness! I'm so glad I found this site! I live in Colorado and remember matsutake hunting with my Dad. The Japanese community here is small, and the matsutake hunting grounds of each family was a closely guarded secret. I remember loading up bags of these heavenly-scented morsels. They only grow under certain red pines in the northern woods. My father taught me to harvest them gently, doing as little damage to the pine needles surrounding them, and leaving some for the deer to eat. My mother would freeze-dry some to send to relatives in Japan, and we would feast on Matsutake gohan, Fried matsutake, matsutake soup... and during one particularly abundant season, my mom made these luscious matsutake pickles in 5 gallon jars! I wish I knew the recipe, they kept for years and tasted better with age. I believe she used vinegar, shoyu, kombu, red peppers, salt and sugar. In the 1990s a lot of Koreans moved to Colorado and found out about the matsutake. There would be whole families of them up there with shovels and plows, just plundering the forest...and selling the mushrooms to Asian grocery stores. Many of the matsutake hunting areas disappeared...they had ruined the natural environment for the precious mushroom. Thank you for those gorgeous matsutake photos! Now I'm going to look online for some for sale! I love matsutake but haven't had any in years. We don't have the right climate for it here in AZ and I have never seen it marketed here. My mom, however, remembers hunting for matsutake as a girl. They were living up in Washington state at the time. Eventually, they had to stop as people staked claims on matsutake plots which were guarded fiercely (a close family friend who also used to participate told us that the practice had gotten downright dangerous). When I was little, this friend used to send us matsutake because he knew people who owned plots and so had direct access. I remember Mom would cook them in our New Year's ozouni soup and would also add it into nimono (stew). They were my favorite as they had a very unique flavor, a bit piney which makes sense when considering where they grow. I love matsutake but given my current salary, I don't think I could justify it even as a "splurge." What does the difference of closed caps and opened caps? its as if looks to me that the closed caps arent mature yet and the opened one are the biggest and mature. As with most mushrooms, closed cap ones are considered to be better in flavor. Open caps are more mature, but flavor wise they do deteriorate.